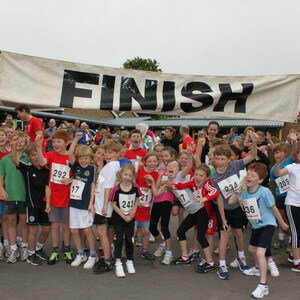 The next ARBAN UK fund raising event is the Olveston School Fun Run this sunday. 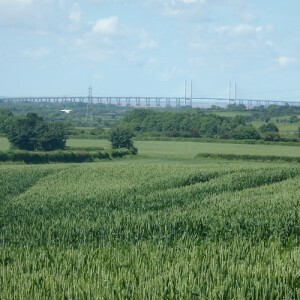 Come along and run or support the 1km and 5km fun run through the beautiful South Gloucestershire countryside, in view of the Severn Bridges. 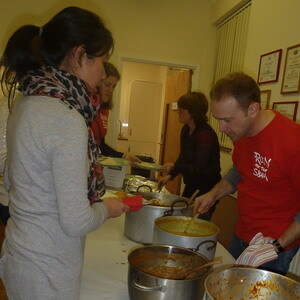 In November 2013 we held our second quiz and curry night fundraising evening. Well done to The Timelords who won with a very impressive score of 85.5 out of 100. Thank you all for the support, with £1200 raised. Maternity, baby, toddler and children’s clothes, toys and equipment sale, being held in support of ARBAN UK: We already have lots of things to sell from cloths to cots, prams and car seats all in really good condition. Newman Hall, Grange Court Road, Westbury-on-Trym, Bristol BS9 4DR. (Opposite the entrance to Red Maids Junior School. Donate items for us to sell for ARBAN UK. Please contact Sally in advance (preferred option) and depending on items and your location, she may be able to collect them from you. Alternatively, bring the items on the day. Take a table for free, man it for us and give us the proceeds – we would really welcome your help as well as your stuff! Tea, coffee and homemade cakes for sale. Even if you do not want to buy or sell anything, come and have some top quality refreshments. Could you keep clean here? A week or so before Christmas I started to feel a little unwell, it started as horrid wind and then progressed to diarrhoea. Within a week, I was feeling really ill and not able to do a lot, I was eating very little and found it harder and harder to look after my two little boys. I missed out on all the Christmas food and drink (and therefore felt rather sorry for myself), however I had all my family around to help with the boys. I was able to lounge about and go to bed early. Eventually after a month, I headed to the doctor, the visit was delayed by short improvements in how I felt (followed by relapses), the Christmas period and the suspicion that they would not be able to help. The doctor did some tests and told me I had giardia, a parasite that is one of the world’s most common causes of diarrhoeal illness. People or animals carrying giardia in their intestines pass it out in their faeces. The parasite is then spread through poor hygiene or contaminated soil, food or water. With a tough outer shell, the parasite can survive for long periods outside a host body, such as in soil or water. A person only needs to pick up a few giardia cysts for infection to develop within their gut. Thankfully it is treatable with antibiotics and relatively rare in the UK – within 24 hours of starting treatment I was feeling almost normal. All I can say is that this was a real eye opener. 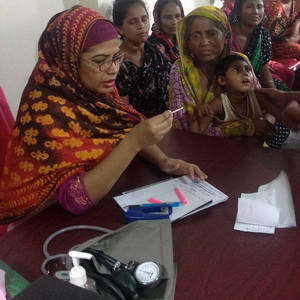 The ARBAN UK committee is working so hard to raise relatively small amounts of money to keep the clinic we have managed to build open and treating these seemingly minor illnesses – things we take for granted in the UK, but which can mean tragedy in places like Jheelpur Slum in Dhaka, Bangladesh. Every pound we raise goes straight to pay for the doctor and drugs in the slum, let us hope we can continue to raise enough to keep it open and stop people having to live with such simply cured and debilitating illnesses. Dress a Girl Around the World is a US charity which asks us to “imagine a world where every little girl owned at least one dress”. The inspiration to achieve this is by encouraging people to make very simple dresses – from a pillow case or 1m of fabric. Dresses are then sent to charity representatives who distribute the dresses to girls all over the world and we are excited to announce that we are now an international representative. 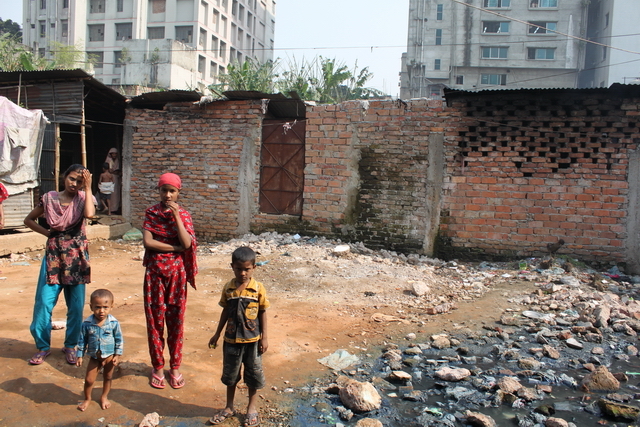 If you feel inspired to make a dress and are in the UK you can send any dresses to us and we will distribute them in Jheelpur Slum in Dhaka, Bangladesh. 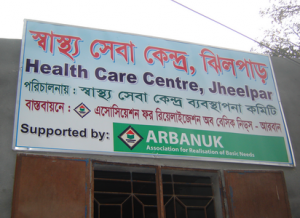 I’ve just returned from a visit to the ARBAN UK funded clinic in Jheelpur slum in Dhaka. 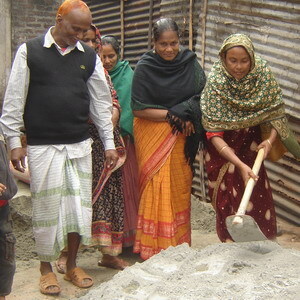 The clinic has been constructed despite lots of problems in the slum. Space in the slum is at such a premium that even though the slum dwellers don’t own the land they are very protective and it has been difficult to get land to build the clinic. It’s down to the hard work of our colleagues at Arban as well as the dedication of some community leaders that we have managed to have a clinic in the slum at all. Walking through the slum the familiar smells and sounds come back to me. Some residents appear to recognise me but it’s just starting to rain so many are quickly preparing to move inside. I am expecting the clinic to be on the ‘main’ road but actually it’s at the end and up a flight of steps which I am informed by Atiqullah, our new project coordinator, ARBAN UK has funded. The clinic is built on slightly higher ground and backs on to the edge of the slum. It’s wet season and aside from the usual pungent smell of rubbish and waste, water from neighbouring apartment blocks and factories is pouring through the wall and down the path that we have constructed to get to the clinic. A few extra taka will provide a pipe to take this water away from the clinic and I ask Atiqullah to arrange it. I don’t think the water is entirely clean. Dr Misty sits in the clinic and already a large crowd has formed. This is partly due to our presence but partly due to the fact that the clinic only operates 3 days per week and so her services are in demand. The health coordinator, Ibrahim, has a matching desk to Misty and is busy processing various log books and pieces of paper. His job is to register everyone in the queue and records if they are male or female, their name and brief details of their medical condition. We take our shoes off and enter the small room. All the plastic chairs are taken and so I sit on the medical couch that is at the end of the room, still with its plastic shipping wrapper intact. A set of scales, a height measure and a first aid box are about the only pieces of equipment I can see apart from Misty’s stethoscope and blood pressure band. Rahima, one of the community leaders arrives and shakes my hand. She says it is a gift from God, waving her hands at the tin roof and white wash walls. It’s quite basic but she is smiling and I suddenly realise what a difference we are making. The patients start telling Misty what is wrong with them. None of them appear terribly ill but they all have their blood pressure taken and one or two have their temperature checked and their eyes looked at. One boy, who apparently is 6, has a mild fever and his temperature is checked. Actually this appears to be the least of his problems as I am informed that there was some ‘accident’ at his birth. He is painfully thin, cannot talk and I wonder if he would live very long if mild fevers took hold. Misty is frantically writing her notes on her ARBAN health project pad. She keeps having to move the carbon paper underneath so she has a record too. The notes also contain the prescription which she gives to each patient. Prescription in hand the patients move back to the health coordinator who issues the medication from a store behind his desk, it looks like a plastic vegetable rack, but it works. The patient pays 10 taka (8p) and then sits down again. I realise that the clinic is becoming a social centre as well as a place to see a doctor. I also realise that the stationery budget I’ve been given is probably low, given the number of bits of paper going backward and forward. Kamal, a founder of Arban who has just arrived, explains to me that just the piece of paper is helpful to get treatment at one of the NGO and charity hospitals in Dhaka. Misty leans over and says that many of her diagnoses are incomplete as she really needs blood tests and x-rays. She wonders if we can help? Misty is seeing people quite rapidly now. She is skilfully assisted by Shirien who is a girl who lives in the slum and is now being employed by the clinic. She moves equipment about, staples pieces of paper together and generally smoothes the process. She reminds me of a dentist’s assistant, knowing what to do without a word being said. Ibrahim is assisted by Sweety, another girl from the slum, who also appears to know exactly what to do for each patient. I realise that, having seen over 600 people since opening, the clinic is operating pretty well. It could do with some more equipment, a sink and an area where private examinations could be done, but it’s a start and I feel very humble that in some part I’ve made this happen. You can see the photos of my visit here. 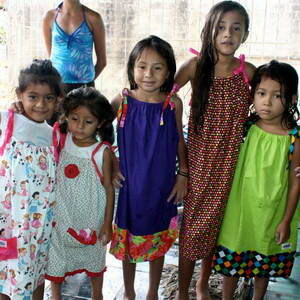 Dresses are then sent to charity representatives who distribute the dresses to girls all over the world. If you feel inspired to make a dress, details of international representatives can be found on the website. 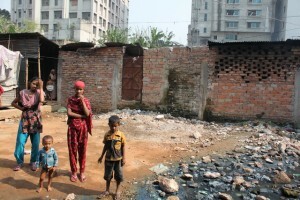 If you are in the UK you can send any dresses to us and we will distribute them in Jheelpur Slum in Dhaka, Bangladesh. Arban UK has recently been able to send a substantial amount of funding to pay for the completion of the health centre and create a fully operational facility. Within the next few weeks the health centre will be able to serve the residents of Jheelpur slum thanks to the generosity of everyone who has donated, sponsored or given in kind to Arban UK. A slide show of the construction can be seen here.